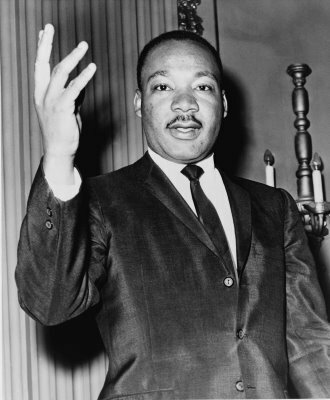 Last month, I posted about the civil rights movement in honor of Martin Luther King Jr. Day. I mentioned sit-ins to protest segregated restaurants, and I shared trailers for books about church bombings and school integration. 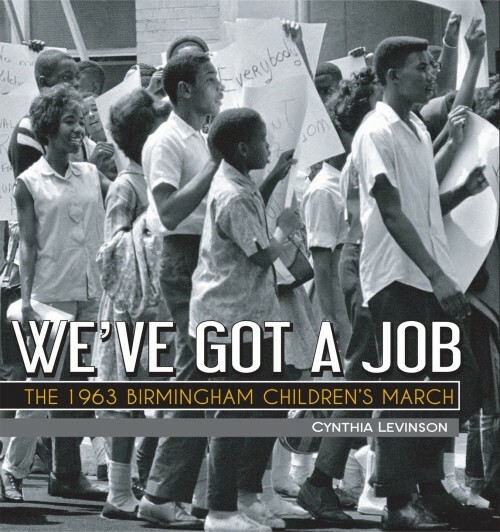 But there’s one thing I didn’t talk about at all: the 1963 Birmingham Children’s March, when 4,000 black elementary, middle, and high school students chose to be jailed as part of the fight for civil rights. Pretty incredible, right? But even more incredible in my opinion — I don’t remember ever hearing about this before! Now that I know about it, I feel like this amazing story should be shared with everyone… so thank goodness for We’ve Got a Job by Cynthia Levinson! The book traces the build-up to the march, the crazy events during the days of student protest, the kids’ experience in overcrowded jails, and the aftermath of the movement through the eyes of four students who took part in it all. On Thursday morning, May 2, 1963, nine-year-old Audrey Faye Hendricks woke up with freedom on her mind. But, before she could be free, there was something important she had to do. “I want to go to jail,” Audrey had told her mother. Since Mr. and Mrs. Hendricks thought that was a good idea, they helped her get ready. Her father had even bought her a new game she’d been eyeing. Audrey imagined that it would entertain her if she got bored during her week on a cell block. That morning, her mother took her to Center Street Elementary so she could tell her third-grade teacher why she’d be absent. Mrs. Wills cried. Audrey knew she was proud of her. Then Audrey’s parents drove her to church to get arrested. What the wha?! Can you even imagine getting ready to do something like that? It makes for a totally gripping read — kind of a cross between a textbook and a suspense novel! Of course, if you want an actual novel to read after We’ve Got a Job, then don’t forget Nancy’s recommendation for Black History Month: Gabriel’s Horses by Alison Hart. Or if you have your own favorite book on the topic, leave a comment and tell us about it! Karen used to avoid nonfiction, until she realized how awesome it can be! Her favorite kind of nonfiction is crazy factoid books. Review copy of Gabriel’s Horses provided by the publisher. But obviously, MLK Day is not just an excuse to take a break and stuff your face with sugar. So I also spent some time thinking about the man we honor and looking at photos taken during the civil rights movement. When you look at those pictures, it’s truly amazing to think that they were taken in the 1950s and 60s. That wasn’t so long ago, and yet our country was SO backwards! Check out this picture of students getting food dumped on them as they staged a sit-in to protest segregated eating areas, or this photo of a “colored-only” water fountain. Have you read any of these books, or any others about the civil rights movement? Leave a comment and let me know! Personally, I’m very happy not to be in the office today. And I’m sure you’re not overly disappointed about a break from school either. I don’t know about you, but I plan to take full advantage of the holiday — which in my case means a huge array of desserts and a marathon of the TV show Chuck. But before rotting my teeth with sugar and rotting my brain with TV, I decided to spend a little time honoring MLK, since it is his day and all. I have to admit that I don’t do that every year. But I figured, “Hey, maybe I should recommend a book about MLK on Kidsmomo or something…” So I picked up this one: Marching to Freedom: The Story of Martin Luther King, Jr. by Joyce Milton. And it’s AWESOME!